Stunning newly renovated custom home in prime location in the famed " Back Shore area of Gloucester, MA" situated just across from the footbridge to Good Harbor Beach. This luxurious completely renovated home is the perfect setting to enjoy the panoramic views of Good Harbor Beach, Salt Island, Thatchers Island and beyond to the open ocean. This open concept home boasts a state of the art kitchen with center island, 6 Bedrooms, 7 Bathrooms including 4 en suite. Enjoy a coffee or a cocktail from one of the many outside areas that include a large deck and covered porch on the first level as well as a fantastic second floor deck that can be accessed by two of the bedrooms. You will not be disappointed with the view... you are steps from one of the most beautiful beaches. The exterior is shingled with copper trims a sprawling front yard with professional landscaping. 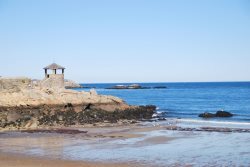 This home is specifically designed and well thought out for those that desire an exceptional level of luxury, the alternative to the high end hotel where family and friends can be together under one roof and have an experience that is not likely to be found in any other home on Cape Ann. First floor features large open concept kitchen, dining room and sitting area with commanding views of Good Harbor Beach, the ocean as far a Thatcher's Island. Fabulous kitchen with island seating for 6, dining table seats 12-14. We stayed in this historic home shortly after a complete renovation was finished. The renovation was done meticulously and thoughtfully as the home has retained all of its charm from the past. However, it also has all of the modern conveniences. It is spacious, comfortable and very well equipped. There are many attractive spaces for sitting and reading a book and watching the ebb and flow of the tide coming in and out of Good Harbor Beach. The large deck and beautifully manicured lawn makes for inviting outdoor spaces, too. It is a very short car ride to the quaint shops of downtown Gloucester. It was totally restorative to stay at 1 Harbor Road. We spent much of our time walking on the beach, reading, cooking and enjoying each other and our surroundings. We cant wait for our next visit to 1 Harbor Road! This home has just undergone a complete renovation...will be completed in early June stay tune for photos!!!!! Please note there is a maximum of 14 guests allowed ANY additional guests MUST be approved prior to the reservation. There are to be no more than five cars for this house rental at any time. Please note there is no on street parking on Harbor Road.